Born on 8 October 1974 in the Nightingale Clinic in Johannesburg, South Africa, Kevin Richardson is the youngest of four children. Richardson had a gift for interacting with all sorts of animals. While growing up in Orange Grove, he showed exceptional affection towards all animals such that by the time he turned three, he had started breeding crickets and had a toad for a pet. He even named the toad, “Paddatjie” which means little frog. When he was 3 years old, his dad helped him rear an injured baby bird which had fallen out of its nest. Eventually Richardson started to nurse all kinds of birds that even neighbours recognized his talents and titled him “The Bird Boy of Orange Cove”. At the age of sixteen, through Stan Schmidt, he was introduced to the world of zoology where he started on the path in becoming a “self-taught zoologist.” However, after pursuing 2 years of zoology in university, he quit the course and started lessons in marine biology which also ended unsuccessfully. Deterred by his failures, Richardson lost hope in having a career in working with animals and hence he started a career in physiotherapy while working with animals at the Lion Park as a pastime. According to Richardson, they were the reason for his “entry into the world of lions.” However, Richardson soon noticed that after the cubs grew into adults they were shifted out of the Lion Park into other facilities. Once the cubs were no longer able to do their “cub duties” of being cute and adorable, they disappeared, some into breeding farms and the rest just disappeared or went sold to the hunting industry. Only then did Richardson realize the plight of the captive lions. Richardson with grown up Tau and Napoleon. Image Source. Thus, Richardson started thinking about moving away from the Lion Park and getting a large conservation sanctuary on his own, which would allow the captive lions to roam freely and not suffer behind cages. With the help of Rodney Fuhr, Richardson previously managed a special facility called the “Kingdom of the White Lion” in Broederstroom, which is an 800 hectors park. It was the set that was built for the movie, White Lion. 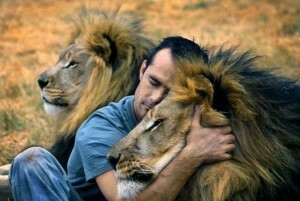 He cared for more than 26 lions, many hyenas, leopards and other animals even though he had little help. Finally, in 2013, with the help of numerous donors, he was able to establish “The Kevin Richardson Wildlife Sanctuary” in Welgedacht Game Reserve, South Africa. The sanctuary, now home to the animals that Richardson bought over from the Lion Park, is on a privately owned plot comprising 1,200 hectares of rolling grassland. He is finally able to watch over his beloved animals in his own unique manner without restrictions. Richardson interacting with the lions he has raised. Image Source. 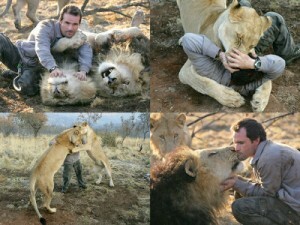 Kevin Richardson and his family. Image Source. Married to Mandy in 2007, Richardson is now a father to 2 children, Tyler, born in 2009 and Jessica, born in 2013. His wife, Mandy Richardson does marketing for both him and the Lion Park. She helps Richardson gather support and funding for his cause of protecting the wild animals. However, even she acknowledges the risks involved in Richardson’s controversial style of handling the animals, especially the dangerous predators. Richardson kissing his son Tyler. Image Source.